Making a fateful decision, Arkie (John Hawkes) and Toni Jo (Jaime King) decide to buy a gun from some shady folk. Irving and director Tom Anton carefully designed a visual style that would “cool off” and desaturate the color palette as our heroine journeys deeper into darkness. This “flat” composition also accentuates the “dead end” aspect of the story. This usage of composition contrasts the caged-in “flat-space” of Toni Jo’s prison cell existence with the deep-space of the “free” world (complete with ray of sunshine). The production inherited the basic prison set from HAROLD AND KUMAR ESCAPE FROM GUANTANAMO BAY--although many modifications were, of course, made. Lawyers Norman Anderson (Tim Guinee) and Clement Moss (Leigh Whannell) wait and hope for a miracle. The deep focus was achieved with a split-field diopter in front of the lens, with the edge disguised by the vertical line of the bookshelf curtain in the background. During happier days, Toni Jo (Jaime King) and Cowboy (Jason Lewis) walk off into a sunny afternoon. Irving often likes to redefine the aspect ratio within the frame. In this case, the eye is directed to the square at the center of the wide screen. 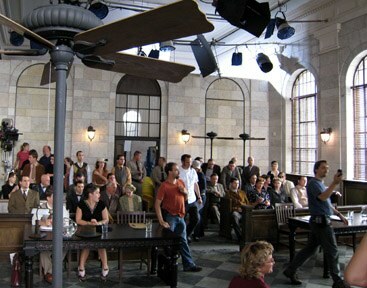 The courtroom set used in THE PARDON was actually the Chamber of Commerce building in downtown Shreveport, Louisiana--brilliantly transformed by Production Designer Anne Stuhler and her art department. Shooting a 1940’s bar exterior at night. From left to right: Irving and director Tom Anton watch the assistant’s monitor as 1st AC Lisbeth Storandt (center) keeps things in sharp focus. Camera Operator Jerry Lane sits behind the eyepiece. Camera Operator Jerry Lane frames up another shot as 1st AC Lisbeth Storandt checks the focus distance. 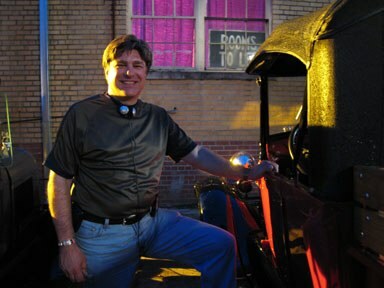 Director Tom Anton strikes a triumphant pose alongside one of the productions many period vehicles.